Diamond Trust Bank started as a financial institution in 1946 in Dar es Salaam and has grown into a leading commercial bank offering a wide spectrum of banking services in East Africa. 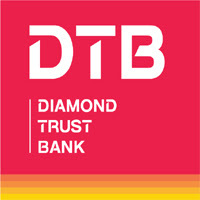 DTB group operates more than 130 branches in Tanzania, Kenya, Uganda and Burundi. The Bank has 28 operational branches in Tanzania. DTB-Tanzania is looking for bright and well-rounded graduates with outstanding academic qualifications, eager to nurture their intellectual strengths and leadership competencies for a two years training program within the Bank. The program is an exceptional opportunity for fresh graduates to foster a career in banking. Job Purpose: Over a period of 24 months, you will be provided with on-the-job rotations within and across all Bank functions in an accelerated learning environment on the basis of which you will be able to assume higher responsibilities in the near future. Opportunity to acquire working knowledge from seasoned bankers. Inculcate management skills from mentoring / formal training and hands on work experience. Only Graduates meeting the above qualifications need apply. The closing date for applications is 23rd August 2018. Only shortlisted candidates will be contacted. DTB-Tanzania is an equal opportunity employer. NB: The closing date for applications is 23rd August 2018. Only shortlisted candidates will be contacted. DTB-Tanzania is an equal opportunity employer.